For your clients, choosing a charity to support is usually the easiest part of the charitable giving process because they probably have a personal connection to specific causes. But with the many giving strategies, tax issues, and timing concerns, sorting out how to give is not always so straightforward. You can add tremendous value to the client-advisor relationship by helping your clients determine the best strategy for their financial and charitable goals. Here are six of the most useful charitable planning techniques for financial advisors to present to and discuss with their clients. One of the most popular giving strategies, outright gifting is an appropriate technique for donors who want to see their charitable dollars at work during their lives. Charitable organizations like outright gifts because they provide immediate resources that can be put toward the most pressing needs. Donors tend to like outright gifts because they are easy to understand and implement, and they are appropriate for gifts of almost any size. Also, outright gifts can provide your clients with an immediate income tax deduction. A donor-advised fund (DAF) is a hybrid form of outright gift that permits the donor to make additional outright gifts to the same fund into the future. Held and administered by a qualified public charity, a DAF is an effective means of giving for clients who wish to retain some control over when and how the funds are distributed to the charity. DAFs offer immediate income tax advantages each time the donor makes a contribution. In addition, they provide many of the advantages of a family foundation—such as legacy creation and family learning opportunities—without the complexity. Clients may prefer to give to charity posthumously for various reasons, including the desire to control assets during their lives or to retain anonymity until death. Bequests can come in the form of beneficiary designations, a will, or trust provisions. If a client has estate tax concerns or may need to access his or her assets during life, a charitable bequest may be the best option. Although not income tax-deductible during life, bequests offer a number of other advantages, including revocability, simplicity, and changeability. With a charitable gift annuity, the donor transfers assets to the charity in return for the charity's unsecured promise to pay an annuity to the annuitant. Because the charity guarantees the payout with its own assets, be sure to review the charity's financial picture and its historical success with other fund payments. The immediate tax deduction is equal to the difference between the fair market value of the donated property and the present value of the annuity. Charitable gift annuities are a relatively simple giving technique, but the donor carries some risk of economic loss, and a portion of the annuity income may be subject to income tax. A charitable trust is a complex planning technique requiring legal and administrative support. 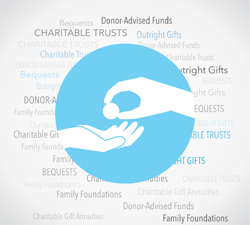 A major advantage of charitable trusts is their flexibility in addressing unique estate objectives and financial issues. Two common types of charitable trusts are charitable lead trusts and charitable remainder trusts. Both are trust agreements, not contract-based donations. The assets are held by the trust and managed by a trustee, and the payouts to the beneficiaries depend on the trust assets. Professional advisors generally handle the administrative tasks and investment management of the trust assets at the direction of the trustee. Charitable trusts make sense for donors who have a strong charitable intent, wish to minimize estate or income taxes, or have significant illiquid assets that are not generating income. Family foundations are separate legal entities established to hold, manage, and distribute gifted assets. They are the most complex means of giving, similar to running a small business. A family foundation requires an operational board and management personnel, adherence to complex IRS regulations, and fulfillment of state and regulatory reporting responsibilities. Among its advantages, a family foundation allows the donors to establish a legacy, provides a positive experience for family members, and permits retention of a high degree of administrative control. Given the costs of establishing and running a family foundation, this planning technique should be reserved for high-net-worth clients with strong charitable inclinations. After evaluating and selecting a giving strategy, your clients get to dive into the fun part: giving back. And it will be all the more enjoyable knowing that the donations were made strategically and are in line with their long-term financial goals. Which giving strategies are most popular among your clients? Have you run into any challenges with these charitable planning techniques for financial advisors?